Bluegrass Horse Feeds, an innovative Co Tyrone based horse feed company which produces quality and innovative horse feeds, will be exhibiting and presenting at the Irish Thoroughbred Breeders' Association (ITBA) Expo on January 27. The 2018 Expo, which takes place at Goff's Sales Complex, is the only event of its kind in Ireland and will feature a number of exhibitors and key presenters. The two-day event gives suppliers, service providers and companies, associated with the racing and breeding industry, an opportunity to showcase their products and services. 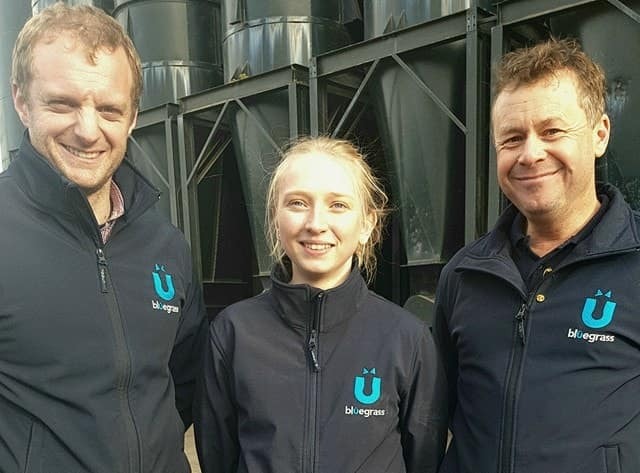 Ashley Neely, BSc SQP and Craig Kileff of Eglish based Bluegrass Horse Feeds, will take to the stage for a presentation on 'Feeding For The Future'. The Bluegrass team, which works closely with riders and owners from all over Ireland using the latest nutritional research and technology to achieve optimum performance from their horses, will be at Stand M55 in the Expo Marquee. Speaking from the Tyrone mills, Ashley Neely said: "This event is for the thoroughbred industry so it's a privilege to be asked to present at it. We will explore topics such as nutritional influence for optimal fertility, feeding the foetus, nutritional demands for the lactating mare, feeding for optimal growth and feeding for the future. "We will be exploring how nutrition has a vital role in both mare and stallion fertility rates, we will look at the new nutritional approach of feeding the pregnant mare throughout her pregnancy and we will be discussing how important this stage is for foetal growth and growth of the newborn foal. "We will also examine nutritional influences of the growing foal, the risks of developmental orthopaedic disease and how this can be prevented and we will look briefly on the nutritional influence of the weanling. We will also be exploring feeding for the future and what that means." Bluegrass Horse Feeds is Ireland's exclusive Kentucky Equine Research (KER) partner so everything the company does is science driven which enhances the team's knowledge and formulations to provide the best nutrition for equine athletes. Popular feeds for the thoroughbred industry are the Bluegrass Stud range (mix and cubes), Race Horse Cubes, Foal and Yearling Mix, Prep14, Race 13 Hi Performance Mix. Craig Kileff, who is also attending the Expo for Bluegrass, said: "The team is looking forward to meeting people from the breeding industry and letting them know how KER formulated feeds can benefit their business and help grow their foals to their maximum potential and hence maximise their investments." The Bluegrass Horse Feeds presentation takes place at 9.45am on Saturday, January 27. Ashley Neely, Craig Kileff and Conor Sheridan will be available for the two days at stand M55 in the Expo marquee.